Contract packaging is available for a variety of one, two and three component liquid and paste systems. We provide pouch filling services or burst pouches can be purchased unfilled. 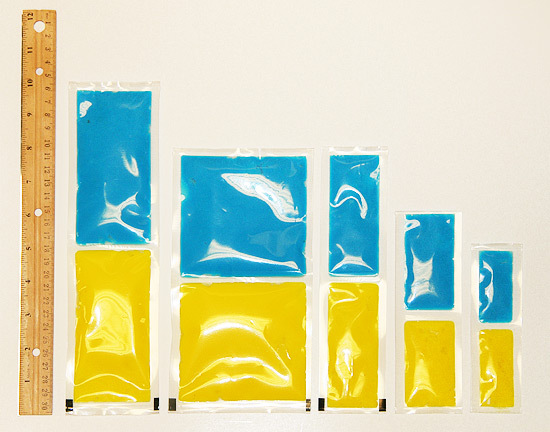 Lead times on production orders are 2 - 3 weeks when standard stock size burst pouches (burst bags) are used. Samples available in 1 - 2 weeks. Custom size burst pouches (burst bags) range from 1.5" x 2" to 18" x 20"
You can supply your liquids or pastes to be packaged or we can recommend and supply a standard or custom formulation epoxy, urethane or silicone. Custom printing directly on the burst pouch (burst bag) or a custom printed outer package is available with your company information and or instructions with up to 10 ink colors in either flexographic or process print.